Beginning in early March, a sample of 10,000 reader/patrons across the country who currently use talking book services will be invited to participate in a nationwide survey. The information collected from this survey will guide the National Library Service (NLS) as they move forward on a variety of projects to enhance and expand the braille and talking- book program. You may receive an invitation by mail, email, or phone. In order to ensure ease of use, readers selected for the survey will be given the option of responding in a number of ways to their invitation. Once you have received your invitation, please feel free to contact Gallup Support at galluppoll@gallupmail.com if you have questions, or call 1-888-297-8999. A regional library of the National Library Service for the Blind and Physically Handicapped (NLS). 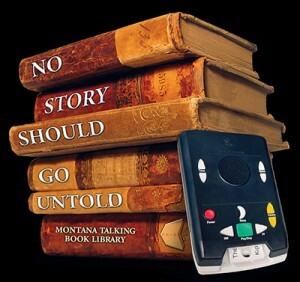 The Talking Book Library is a program of the Montana State Library and is funded in part with monies provided by the Library Services and Technology Act through the Institute of Museum and Library Services (IMLS). Sometimes the best words on the page aren't on the page. That's why Montana Talking Book Library offers high quality audio books and magazines recorded by trained narrators for your reading pleasure. Because No Story Should Go Untold.